Apparently, I'd need an invitation to create a profile there. That's fine, I've been around stackoverflow, got a bit of score on SF, shouldn't be a problem, right? Moreover, there are career postings for sysadmins all over the site, so the careers site should cater to sysadmins, right? Wrong. They want to know if I'm a real programmer in order to provide an invitation. So my question is - why? Why only programmers? EDIT: I can find work on other sites, but the stackexchange network is well known and quite a few programmers I know get headhunted through SE, especially for the more interesting types of positions. And what is more important, they get relevant offers. I mean we all know how tiring it is to repeat over and over to every calling recruiter, that if your resume mentions Windows XP somewhere, it doesn't mean you are interested in junior helpdesk positions. Moreover, it looks like a person with high enough rating on SE, can use that rating, so why not let everyone enjoy well earned ratings and publicity? Having had to hire some windows admins a while ago, I remember how people with fake resumes came in, showed off a braindump assisted MCSE cert and wasted my time. I know for certain that someone with over 5k points on SF (and relevant activity of course) cannot be a pMCSE, and so do the HR folks. This is really a minor copy issue that we'll find an elegant way to fix. Careers is for programmers, and it is for sys admins. While the majority of positions on the site and employers using the search product are looking for programmers, we do have specific filters on both products to target the sys admin population on Server Fault. The only excuse or reasoning I can give for the current language is that it had the biggest success in turning away the users we didn't want signing up for a profile. However, it's not clear to Server Fault users that they are welcome and encouraged to create a profile. We'll make this clear shortly. It's easy to think that careers.SO is designed to be monster.SE, but it's not. I've seen stated multiple times on SF that SE sites exist to drive traffic to the careers site, so I've always taken it for granted that it was meant to be a general purpose career site. Makes sense, so I had no reason to question it further in my one year of being on SF. On second look though, the assumption that it's a careers site for SE in general is incorrect. If you've been on SF long enough, you've probably gotten one of the invites to the careers site. I've gotten one too. But look at it more carefully: "In recognition of your contributions to Stack Overflow". I wrote that off as auto-mailers that haven't been updated to use the StackExchange verbiage, but on further research I received that within 30 days of answering a question on SF that was migrated to SO. When you actually look careers.SO though (particularly careers.SO/about), everything about it that is not user submitted content points at the site being marketed directly at programmers. The fact that other professions can get jobs there appears to be a happy coincidence that the SO owners benefit from. Now, I could be wrong, but before you downvote, please drop a comment linking to something on the careers site that is not marketing it as a site for programmers. Tags, job postings, etc. don't count. This is a great question, and I think there's more than enough room to grow the marketing for careers.SO in a direction that is more inclusive of system administration, particularly since it's already being used by them. But don't confuse who it's exclusively marketed to, and the people who are finding other uses for it. Stack Overflow is a big draw for developers. That's what companies want the most right now. Even the systems administrator jobs are in developer-driven or dev-focused firms. There's no lack of systems administration jobs on Careers.SE, though. I can attest to the appeal of the site for hiring purposes across disciplines. When hiring, I had my organization post here. I've also received at least seven job offers/opportunities here since I established a profile. 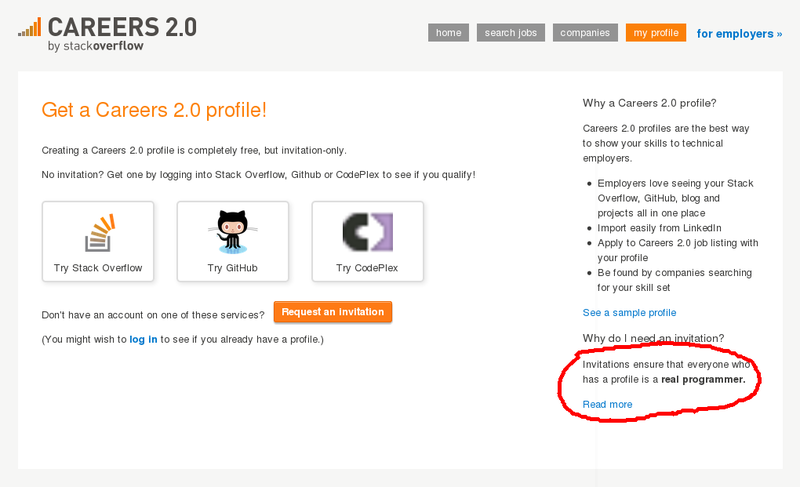 As a sysadmin, it seems like you're looking for the "Careers by ServerFault site" (which I don't believe exists yet), not "Careers by StackOverflow". StackOverflow, and the associated job search site, are for programming skills only. Not the answer you're looking for? Browse other questions tagged discussion support status-planned careers .